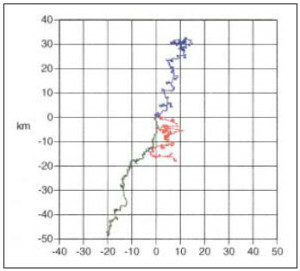 Progressive Vector Diagram of currents at three depths above the outfall site. The green line, which is nine metres off the bottom, shows south-eastward (shoreward) flow. This is the second in my series of short articles about the Environmental Impact Assessment (EIA) process for mineral extraction. When a proposed mining activity potentially impacts the marine environment, the company is commonly required to undertake “physical oceanographic” measurements and analysis, and frequently also hydrodynamic modelling. These inform the relevant permitting agency about ocean currents, likely dispersion plumes, settling patterns, upwelling, surface trajectories, and so on. Frequently, the studies are performed by specialist marine consulting companies, though they, or the mining company, may also choose to sub-contract university-based scientists or engineers. The EIA process culminates in an Environmental Impact Statement (EIS). In the early 2000s, I was engaged to review the physical oceanographic EIS for a proposed mine in PNG, known as the Ramu NiCo mine, which was seeking permission to dump its spent tailings into the ocean. My section of the EIS was comprised of several large 3-ring binders, covering remote sensing data, moored instrument data, some water samples, several computer modelling studies, a bit of analysis, and a review of what was known of the local oceanography (very little). The people that engaged me were skeptical of the safety of the system, and frankly I do not think they trusted their own government to adequately evaluate the EIS. I submitted my review, which contained some recommendations for further fieldwork, and attended a meeting in Port Moresby where it was presented along with reviews of other aspects of the EIS (such as marine and terrestrial ecology, fisheries, and marine chemistry). The result of our efforts was eventually written up as an article in a mining industry publication. About six years later, when the mine and processing plant were nearing readiness, landowners near the proposed coastal processing plant brought the matter to court, seeking an injunction against the tailings dumping. I was again asked on behalf of local landowners to review physical oceanographic studies. In the intervening years, a few computer modelling studies had been done, but very little fieldwork — certainly nothing of the sort I recommended in my review¬. As plaintiffs, they requested that the “independent experts” (myself and several others) outline where the science in the EISs was flawed, misleading, or inadequate. In my opinion, the EIS contained some quite good and some very inadequate scientific evidence. A single example will serve to illustrate the latter. A particular question was whether upwelling would occur, so the main contractor installed a device known as an ADCP, which measures water currents from top to bottom (aside from a blanking zone of a few metres close to the instrument, which was installed at the sea floor). Some results from these observations are shown in the diagram. The green line shows the net flow nine metres above the bottom. To an oceanographer, knowing that the instrument was located a few hundred metres north of the shoreline, a single glance shouts “upwelling”. For the time period shown, currents near the bottom at the proposed outfall site shoot landwards (upslope) at a rate of about 800 metres/day, like a huge fire hose. In other words, water at the outfall site, which could potentially contain toxins harmful to human health, was moving quickly shoreward, at a rate that would take it onto the shallow fringing reef in a matter of hours. What disturbed me was that the EIS authors presented the diagram without so much as mentioning its implications, i.e., the apparent upwelling. Did they even notice? It was like colour by numbers, with no appreciation or understanding of oceanographic processes. Some five or six years later, when I again became involved because of the court case, I was astonished and disappointed to find that, despite my having highlighted the upwelling in my original review, the company never conducted a follow-up survey, with instruments between the outfall site and the shoreline, to determine how far up into the shallow water the canyon upwelling extended. Additional computer modelling with adequate resolution should also have been done, as it could have identified the controlling factors and provided insight into whether the upwelling was likely to cause a problem. No relevant fieldwork or modelling was ever done. All the fieldwork and modelling was done had spatial resolutions far too coarse to be of any value. The outfall has been operating for over a year now. As far as I know, to this day, despite millions of dollars spent on the physical oceanographic component of the EIAs, the question of whether canyon upwelling is pumping toxins up onto the reefs, is a complete unknown. Acknowledgements: I wish to thank MPI and Phil Shearman for their superb work in supporting the critique of the Ramu Nickel EIS.